MILAN - Italy's leaders sought to affirm their commitment to a free press Tuesday after journalists protested around the country against insults emanating from prominent figures in the governing 5-Star Movement. 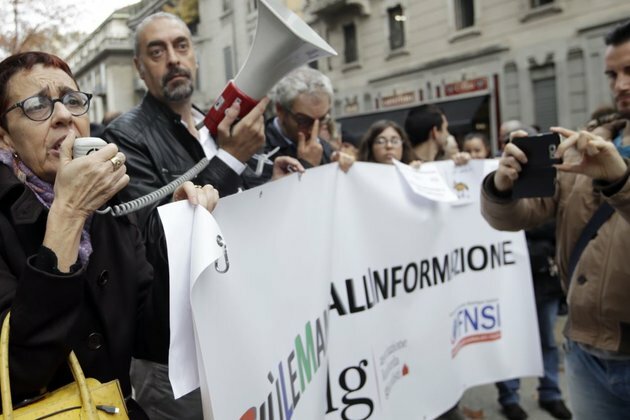 Journalists gathered in piazzas in regional capitals to protest statements by 5-Star leader Luigi Di Maio and another prominent official labeling journalists 'prostitutes,' 'jackals,' and 'intellectually and morally corrupt,' in reaction to coverage of a long corruption inquiry against Rome's mayor that ended with an acquittal this weekend. The trial, in which Mayor Virginia Raggi of the 5-Star Movement was accused of lying to anti-corruption officials, threatened not only to unseat her but also risked the reputation of the 5-Star Movement itself.After her acquittal, Di Maio and Alessandro Di Battista immediately lashed out at the media for its years-long coverage of the scandal. Protesters called the attacks a threat to democracy and said they aimed to sound the alarm over 'a political philosophy that is emerging around the globe,' scapegoating journalists. They also noted that the Raggi coverage differed little from coverage of other political leaders accused of scandals in the past. Paolo Perucchini, president of the Lombardy journalists' association, said politicians have criticized reporters for years, but the insults and threats had become systematic in recent months. 'Free information frightens those who want to control the country with a single thought,' Perucchini said. The clash follows quickly on the heels of the Trump administration's moves to revoke the credentials of a CNN reporter, and after Trump separately lashed out at three female African American reporters. The 5-Star Movement has aimed to further reduce state support of media, while the movement itself relies heavily on social media, including its popular blog, to get its message out.